The Cover of John Severson’s Surf. 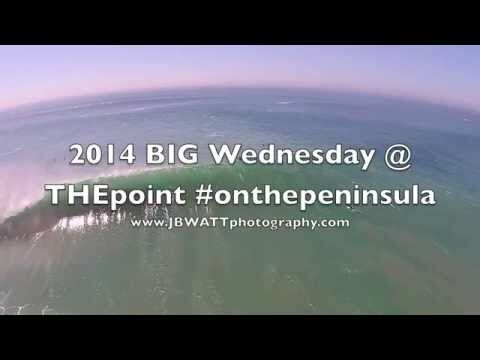 On “Big Wednesday,” August 27, Hurricane Marie’s category five-driven waves hit Newport Beach, California with the sort of force you’d expect from a massive wintertime Aleutian swell along Oahu’s North Shore. Why though, was Newport in particular, so damned big – resembling a mutant cross between the Banzai Pipeline and a perfect Indonesian pointbreak? The reason for these incredible waves – captured to stunning effect by Newport lensman Justin Watt and his pet drone – lies in the the shorter-period, more ‘close together’ nature of the swells kicked out by Marie’s category five winds, the extreme southerly direction of the swell and a curious offshore feature known as the Newport Canyon. As Solspot meteorologist Adam Wright explains, the canyon’s effect is usually not even felt by deeper, ‘long period’ swells that normally roll across the canyon, but when a swell borne of a nearby hurricane is in the water, the canyon magnifies the swells like light through a magnifying glass, and magic happens. This morning, Dr. Shelley Hendel, an Australian field pediatrician with Australia’s Healthy Mothers, Healthy Babies program snapped an astonishing photo of a eruption of Mount Tavurvur in New Guinea that has thus far sparked evacuations and rerouted flights, but caused no deaths. Hopefully things will stay that way. Hendel tweeted her morning view to the world. It is also the most unwanted. The US government has been trying to sell Minot’s Ledge since 2009, and there has not been a single bid in 5 years. What is that smell when you’re miles from the beach but you still get that salty, sharp smell that whelms your senses as you come down the seaward side of a mountain or crest? Maybe your eyes don’t know it, but your senses of taste and smell sure do. Late afternoon on August 26, the first waves from Category Five Hurricane Marie began sweeping into the beaches of Southern California. Surf meteorologists who predicted the biggest south swell in ten years, turned out to be spot on, as spots from Orange County to Malibu lit up with surf not seen since the last seriously El Niño-fired summer brought hurricanes Guillermo and Linda back in 1997. A High Resolution “Rapid Scan” image of Hurricane Marie from NOAA’s GOES 14 satellite. These photos were captured by venturous Belgian photographer Antoine Rose while he was hanging from a doorless helicopter and moving 20 nautical miles per hour at an elevation of 300 feet. Take a full moon rising over the Santa Ynez mountains, throw in a smattering of clouds hovering over a surging Pacific, add a generous sprinkling of stars and an otherworldly northern light from Vandenberg Air Force Base, and stir with a long-exposure from a nice, new Nikon, and you’ve got Jalama Beach, one of the remotest, most jaw-dropping beaches south of California’s Lost Coast. Jalama is reached via a serpentine 14-mile drive through a sublime old west landscape of rolling hills, chaparral, majestic oak and longhorn cattle that has managed to escape the bulldozer, grader and Spanish-style tract house that afflicts so much of southern California. It’s a wide, arcing crescent of coarse sand, epic waves, damned big sharks, scouring, frigid winds and mesmerizing beauty. Now that the kids are back in school, and the noisy RV families have packed up, you can find a beachfront Jalama campsite all to yourself through Santa Barbara County Parks. To learn more about Jalama and some of the best coastal overnights from Point Conception southward, here’s a story I wrote for The New York Times a few years back about fall coastal camping in Southern California.